Any cutting tool may break or shatter under improper use. Government regulations require use of safety glasses and other appropriate safety equipment at all times in the vicinity of use. Wet or dry grinding of cutting tools produces potentially hazardous dusts or mists; to avoid adverse health effects, use adequate ventilation and read the Material Safety Data Sheet for further applicable tool material or grade before grinding. Terms: 2% Ten days, Net 30 days. Shipping F.O.B. Santa Clara, California. All shipments ship ground, unless otherwise specified. Orders must be in by 3:00 p.m. for same day shipping. DESTINY TOOL cannot be responsible for the performance of, or compliance of Specifications, nor can we accept, for return, any tool that has been altered in any way by our customers. This includes surface treatments, coatings, flats, tangs, markings, or any geometry alterations. Destiny Tool warrants to original equipment manufacturers, distributors and industrial and commercial users of its products that each new product which it manufactures or supplies is free from defects in material and workmanship. Its sole obligation under this warranty is limited to furnishing, without additional charge, a replacement for, or, at its option, repairing or issuing credit for any such product which shall, within one year from the date of sale by Destiny Tool, be returned freight prepaid to Destiny Tool and which, upon inspection, is determined by Destiny Tool to be defective in materials or workmanship. The provisions of this warranty shall not apply to any product which has been subjected to misuse, improper operating conditions, or which has been repaired or altered, if such would adversely affect performance of the product. Complete written information with respect to all such matters must be furnished to Destiny Tool as a prerequisite to its consideration of any claim or complaint under this warranty. The repair, replacement or issuance of credit for parts provided for in this warranty constitutes the Buyer’s exclusive remedy. The warranty is in lieu of all other warranties, express or implied, including any implied warranty of merchantability or fitness for aparticular purpose. Destiny Tool has no liability or responsibility on any claim of any kind, whether in contract, tort or otherwise, for any loss or damage arising out of, connected with, or resulting from the manufacture, sale, delivery or use of any product sold hereunder, in excess of the cost of replacement or repair as provided herein. In no event shall Destiny Tool be liable for any special, incidental or consequential damages. Destiny Tool makes no other warranty, express or implied, except as set forth above; and neither assumes nor authorizes any other per- son or entity to assume for it any other obligation or liability in connection with any of its products. Goods are considered sold and our responsibility ceases when delivery is made to the transportation company. In the event of goods being lost in transit, we will make every effort on behalf of customers to have lost goods found or to have the transportation company make proper restitution for loss. Damage claims must be made against carrier. Orders for special tools, non-catalog or modified tools, are accepted on a no cancellation basis, and tools are not returnable. A confirming purchase order is required before any work begins on special tools. A 10% over or under shipment on a special is acceptable based on industry standards, unless no over shipment is stated at time of order. Shop minimum of $50 for all specials. 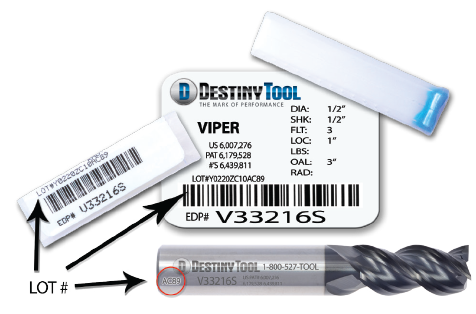 DESTINY TOOL cannot be held responsible for incorrect parts made with our products, due to mislabeling, or defect. We assume all tools used by our customers are inspected before use, and that first part inspection in customer’s plant is the rule. We will replace or credit tools in those situations. All shipment shortages must be reported within 10 business day of receipt of shipment. No credit will be issued for any shortages after this 10 day period.